Anita’s Touring Caravan Park is located in the charming village of Mollington, just outside of Banbury in Oxfordshire. It is a friendly, family run campsite that is located on a small working farm that breeds prize winning Suffolk sheep. 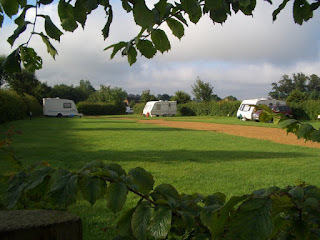 There are three areas within the campsite that will suit everyone’s needs. There's a large area with 12 electric hook-ups for those who need electric, which can take mixed groups of trailer tents, caravans and tents. This makes the site ideal for family groups who have a combination of all 3 and want to be together. At the site there's also 36 to 40 lovely spacious grass and hard standing pitches which should fulfil every caravanner’s needs. If you would like to get a little bit closer to nature without pitching a tent, you can also book a fantastically fun camping pod, always a big hit with the kids! These wonderful pods are well built, insulated wooden huts that provide basic accommodation much in the way of a tent but saves the putting up and taking down, you don’t get wet, there’s heating and lighting plus it’s carpeted too; a home from home if you like!